A former U.S. commander of the International Security Assistance Force (ISAF), a NATO-led security mission in Afghanistan, was the organizer of the July 15 military coup attempt in Turkey, sources said. 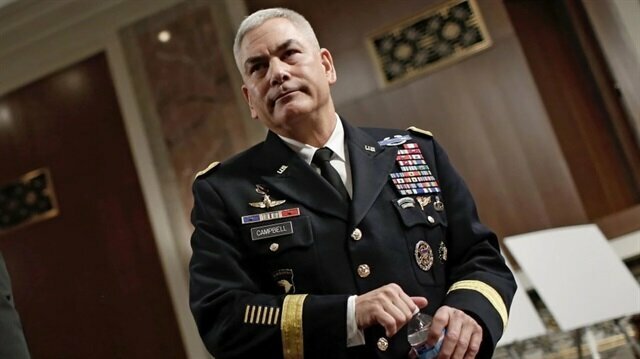 General John F. Campbell was one of the top figures who organized and managed the soldiers behind the failed coup attempt in Turkey, sources close to ongoing legal process of pro-coup detainees said. Campbell also managed more than $2 billion money transactions via UBA Bank in Nigeria by using CIA links to distribute among the pro-coup military personnel in Turkey. The ongoing investigation unveiled that Campbell had paid at least two secret visits to Turkey since May, until the day of the coup attempt. The coup plot that was foiled by the comprehensive effort of Turkish Nation, including its citizens, politicians, media and police forces, was organized by the Fethullah Terrorist Organization (FETO) led-by so-called cleric Fethullah Gülen who has been living in self-exile in America for several years. American Intelligence, Military and other institutions are accused of supporting the FETO leader Gülen and his gangs for the military coup. A spokesman for Turkish President Recep Tayyip Erdoğan on Sunday laid out a case for the extradition of Fetullah Gülen to face charges that he orchestrated an attempted overthrow of the government in Ankara.Ibrahim Kalin urged the U.S. to not allow Gülen to “exploit its laws to avoid facing a fair and legitimate accounting in Turkey," in an opinion piece published in The New York Times.Kalin wrote that mounting evidence has surfaced that points to Gülen leading the attempt, noting that the coup “was planned and staged by his followers within the army. "Several generals and officers involved have confessed to having links to Gülen.Levent Turkkan, aide-de-camp to the chief of staff for the Turkish armed forces, Gen. Hulusi Akar, admitted that he was a member of the Gulenist organization and joined the coup on order from his superiors within the group, according to Kalin.Akar reportedly told prosecutors coup plotters urged him to speak to Gülen, who lives in the state of Pennsylvania, to persuade him to join the overthrow attempt.“The United States should extradite Fethullah Gülen, a Turkish citizen, to Turkey, as is allowed under an existing treaty," Kalin said. “Turkey has already provided a number of legal documents to American authorities and will send more as further evidence is collected."U.S. officials announced last week receipt of extradition documents for Gülen, following the coup attempt that killed more than 240 people and wounded more than 2,000 others.The Justice Department is reviewing the papers, according to the White House. The U.S. knows the July 15 coup attempt in Turkey was made by Pennsylvania-based preacher Fetullah Gülen, Justice Minister Bekir Bozdağ said Sunday.In remarks made to a Turkish television channel Kanal 7, Bozdağ said: "I am sure U.S. President [Barack] Obama, the U.S. intelligence and secretary of state know this coup [attempt] was made by Fetullah Gülen. I am very sure they don't have any hesitation about this. "The Turkish minister added there would be difficulties in relations between the two countries if Gülen maintained his life in the U.S. after the coup attempt. "They [the U.S.] will also face great difficulties in relations between Turkey and U.S, if the U.S. government continues to keep Fetullah Gülen in the U.S. after the coup attempt," Bozdağ said. "The U.S. government does not have any justification in defending and keeping Fetullah Gulen in the U.S.," he added.He said there was no obstacle in place in international law for the extradition of Gülen to Turkey.Separately, Bozdağ said he would be in the U.S. with Turkish Interior Minister Efkan Ala to discuss the extradition issue.He recalled the fact that Turkey had sent four files to the U.S. authorities on Tuesday regarding the preacher's extradition.Turkish government has repeatedly said the deadly plot on July 15, which martyred at least 246 people and injured more than 2,100 others, was organized by followers of Gülen.Gulen is also accused of a long-running campaign to overthrow the state through the infiltration of Turkish institutions, particularly the military, police and judiciary, forming what is commonly known as the “parallel state”. Military sources said Campbell, who was the commander of ISAF between August 26, 2014 and May 1, 2016, had made some top secret meetings in Erzurum military base and Adana İnicrlik Airbase. İncirlik Airbase has been used by the U.S. Military for conducting the anti-Daesh campaign in Syria. Military sources said that Campbell was the man, who directed the process of trending / blacklisting the military officers in the base. If the coup attempt was successful, Campbell would visit Turkey in a short time, according to the sources. The Nigeria branch of the United Bank of Africa (UBA) was the main base for the last six-months of money transactions for the coup plotters. Millions of dollars of money has been transferred from Nigeria to Turkey by a group of CIA personnel. The money, which has been distributed to an 80-person special team of the CIA, was used to convince pro-coup generals. More than 2 billion dollars were distributed during the process leading to the coup. After taking money from their bank accounts, the CIA team hand delivered it to the terrorists under the military dresses. The sources said that some familiar figures in the Eastern and Southeastern part of the country had taken active roles during the process, while the members of the Gülenist gang have been used in central and eastern region. All officers who command a group of soldiers in a patrol station, unit, company, regiment, brigade, division, corps, or army were kept in close surveillance. In 2015, the pro-Gülenist officers in the İncirlik base established an investigation desk. They drew the map of all soldiers under their command. They investigated the soldiers' trends, their personalities and family background. John Bass, the U.S. ambassador to Turkey, said Wednesday the case of Fetullah Gülen, the expatriate cleric accused of being behind last week's failed coup, would be a “very high priority" for Washington. “It will depend on the scope and quality of evidence that is provided and how compelling that is. But I can assure you that we are committed to reviewing quickly as soon as we receive materials. It will be a very high priority for the US Department of Justice," Bass told a group of reporters before a July 4th reception U.S. consulate general in Istanbul, commenting on how long it might take U.S. officials to review the documents. Turkey accuses U.S-based Gülen of being behind the coup attempt and has demanded that he be extradited to face trial. Materials related to the extradition of the cleric, who lives in self-imposed exile in the U.S. state of Pennsylvania, have been submitted to U.S. authorities. Last Friday's attempted coup by rogue elements of the military resulted in the martyring of at least 240 people and the injuring of nearly 1,500 others. Bass declined to comment on the future of Turco-American relations if Washington does not hand Gulen back to Ankara. “The United States government is focused on what we can do together between two countries to help Turkey pursue this investigation," he stressed. Bass also raised concerns about Ankara's steps to dismiss tens of thousands of public employees in the military, police, education sector, and civil service. “We see mass arrest or detentions and mass firings of people from positions of employment in a very rapid period [of] time without a lot of evidence having been presented for those actions, that creates concerns," he said. On how the thwarted coup affected operations against Daesh from Incirlik Air Base in Adana, southern Turkey, Bass said that there is still no electricity at the base. He said the Turkish government cut electricity at all air bases in response to the coup attempt. “The longer it continues, the more impact it will have on operations, which is not to benefit either Turkey or the United States or the other countries that are threatened by Daesh terrorism," he said. The defense ministers of Turkey and the United States also discussed over the telephone the situation at Incirlik Air Base on Tuesday. Turkish authorities have said coup plotters used the air base as main station for the takeover attempt. Air refueling tankers used in the coup were launched from the base, where 3,000 U.S. troops and U.S. aircraft are stationed in anti-Daesh operations. All soldiers were categorized in three groups: opponents, neutrals, and supporters. A commander from the smallest patrol station to all military units had been blacklisted under the process. The military personnel who were in a neutral position received a difference in the amount of money, according to the importance of their position and ranks. The money transactions were started in March 2015 through the commissioned “courier”. The supports who also were categorized as “those who will move with us,” were provided a huge amount of money. All soldiers and officers in this category were considered as the devoted members of the FETO terror group. A bag with a large amount of money was found in the room of Brigadier General Mehmet Dişli, one of the top military officials detained for leading the coup attempt. The plotters of last week's failed coup attempt in Turkey have used the QQ, a Chinese instant message software, and the Clash of Kings, a real time strategy game software, for their external and internal communication. The pro-Gülenist coup plotters both from military and non-military personnel have used the programs at the last moment. Turkey has foiled a deadliest coup attempt on July 15, when a part of its military had run their tanks through the streets and captured main bridges, airports and strategic points in Ankara and Istanbul. Millions of people took to the streets and squares, ran over the tanks, to defend the value of democracy following a call from President Recep Tayyip Erdoğan. Almost 250 people were killed and more than 2,000 others were injured, when coup military opened fired on the crowd. The Fethullah Terrorist Organization (FETÖ) leader Fethullah Gülen, a so called cleric who have been living in Pennsylvania, U.S., for several years, was the mastermind of the attempted coup. Gülen prompted / mobilized his sleeping cells in Turkey's state institutions for the last bite on Turkish democracy, but failed due to a comprehensive resistance of Turks. Pro-Gülenist coup plotters used QQ software for communicating with their overseas partners while using the Clash of Kings for communication inside Turkey. The FETÖ gang members have established private rooms in Clash of King using code names. They continued discussion over the Turkey coup plan under the guise of a war game planning to avoid intelligence tracking.